Lee Gunawan done it again! After resizing and building the patterns of Unicorn Gundam 5 times bigger including the weapons, this is his new project. 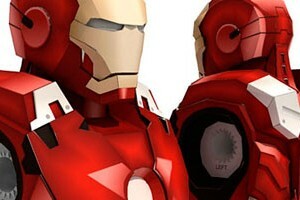 He is on progress on resizing Paper Replika's Iron Man War Machine into life size height, which is 6 times larger than the original paper model patterns. 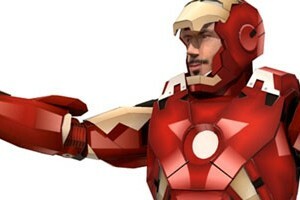 Although he is making a life size armor, he is not going to use that as a costume to wear. He is in this photo wearing that torso armor because I asked for a photo with other object that can be use as size reference or scale reference. 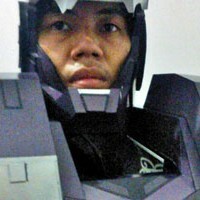 Instead of using any familiar objects, he use his own body :D. His intention is to build an War Machine paper statue, so it can be displayed in future exhibition along with his big sized paper model. This is the first batch, the head and the torso. The patterns need to printed in A3+ paper size printer. Lee, printed those parts in printshop a digital printing shop. This template also can be downloaded in original Iron Man War Machine page, or on the below as usual. Finally after about a week focusing on part 3 patterns, it’s finally finished and released. The template will have the same versions as previously, colored, blank, and weathered blank template and also a rough setup of PDO file for Pepakura Designer. 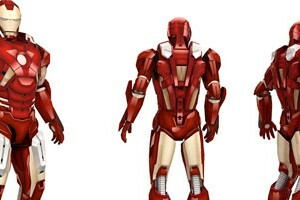 The detail on Iron Man mark VII leg actually is not too detail compared to War Machine one, but the shape is mainly curve that was quite hard to model to become a paper model. The joints are still quite similar to War Machine ones, but I make the hip joints bigger and more complicated on the knee joints. But overall it’s not too hard to build, all parts are quite modular and easy to identified. Assembly instruction images are for the hip and right leg only, the left leg parts are with the same parts number only they were mirrored. Finally part two is released. Several hours ago the maker file of this template was error, I had to ask help on Facebook fan page to recover that file. Fortunately one of Paper Replika Friends, Nega Link was very quick to respond and gave me a hand, the template is saved, thank you Nega Link :). It supposed to finished few days ago, but I was too busy answering a lot of questions from our new visitors. The site was overloaded. The show on Hitam Putih Trans-7 has a huge impact on numbers of visitation on this site. Okay back to the template, it contains 4 pages of patterns for colored version. When this article was post, the blank template was still under development. I suggest you to strengthen all joints or replace it with stronger material, such as toothpick, etc. This one is from Ki Kie, he apparently did not satisfied with the standard parts in Paper Replika Iron Man War Machine that he is on progress building it. 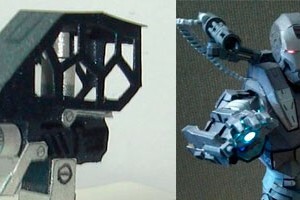 So he made his own template, an Ex-Wife missile for War Machine extension parts. This missile with the funny name is originally placed hidden in the left shoulder compartment of War Machine. In the movie Iron Man 2, that compartment can be open and bring the missile up, shoot and then retract down again. This template has only one page of patterns, also available both colored one and blank patterns. The patterns were hand drawn manually and then he retraced it again in computer.